Which of the following cannot be a possible outcome of passing white light through several evenly spaced parallel slits? The central maximum will be white but the higher-order maxima will disperse into a rainbow of colors. The central maximum and higher-order maxima will be of equal widths. 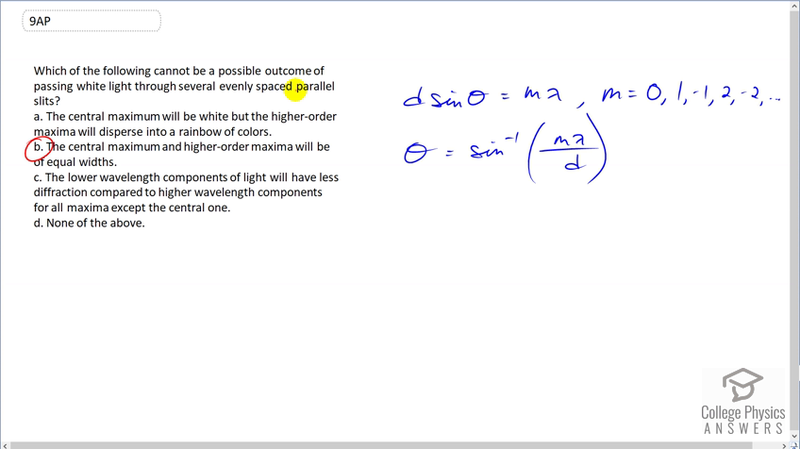 The lower wavelength components of light will have less diffraction compared to higher wavelength components for all maxima except the central one. This is College Physics Answers with Shaun Dychko. We have a formula here for telling us what the interference pattern will be when you have light going through several evenly-spaced parallel slits. And, <i>M</i> is the order of the constructive interference. This is the formula for the bright fringes. And <i>M</i> can be any integer. Zero, one, negative one, two, negative two, and so on. Now, if you solve this for <i>Theta</i>, you find that <i>Theta</i> is inverse sine of the order times the wavelength divided by the distance between each slit. Now, this is nonlinear, which means that <i>Theta one two</i> is going to be different than <i>Theta two three</i>. In other words, the difference between each successive angle is not going to be the same. And so, B is the answer to this question. The central maximum and higher order maxima will be of equal widths. That's not true because this angle <i>Theta</i> will change by different amounts each time you increase the order <i>M</i>.